This Whistler WS1040 scanner radio package includes everything you need to start scanning right out of the box! This package is great for beginners or experienced users. The WS1040 is a digital scanner which covers most all of the newer radio systems around but it will also work with older analog system. We program the scanner for the area you need and the package includes the ultimate user's guide to the radio written by and for scanner hobbyists. Makes for a great gift! If you would like to add other accessories to this package please select from the great options at the bottom of this page when ordering. All of the cities & towns local Police, Fire, EMS. The scanner will be ready to go for your home area or for the person that getting the gift. This is an extremely handy 5.5 X 8.5 perfect-bound book which you can use on your desk, in your car and on the go. The guide is in 4-color with charts, images and super detailed text. This one guide covers all four of these latest GRE, RadioShack, and Whistler model scanners and takes you far beyond what you get with the radio (only a CD-ROM and without the detail of Mark's guide). Go step-by-step through each of the hundreds of features of these scanners and learn what the functions do and how they are enabled and disabled. Mark takes you through the process of planning systems, sites and groups and then programming your scanner with this information. 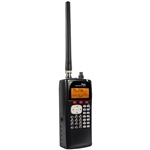 The GRE/RadioShack/Whistler scanners are remarkable radios but to get the most out of them you really need this ultimate manual we are proud to offer.